FPP-1000 - Focal Monoblock 500W RMS Class A/B Power Performance Series Amplifier. 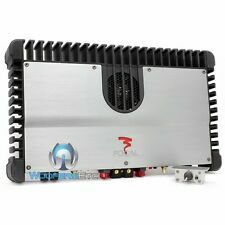 Monoblock Power Performance Series Class A/B Car Amplifier. 3-way protection circuitry (thermal, overload, and speaker short protection). 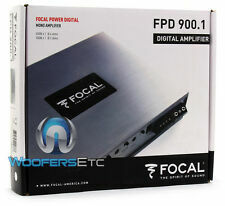 FPD 900.1 - Focal Monoblock 900W RMS Compact Amplifier. 500 watts RMS x 1 at 4 ohms (900 watts RMS x 1 at 2 ohms). Mono subwoofer amplifier. Adjustable bass boost level: 0 to 6dB @ 40 Hz. Heat dispersing aluminum chassis. SOLID1 - FOCAL MONO 470 W RMS 940 W Max POWER AMP AMPLIFIER. (2 Ohms) 1x940W Max. continuous current. Line input impedance 20 kOhms. thermal overload. (2 Ohms)1x470W. FPD 900.1 - Focal Monoblock 900W RMS Compact Amplifier. 500 watts RMS x 1 at 4 ohms (900 watts RMS x 1 at 2 ohms). Mono subwoofer amplifier. Adjustable bass boost level: 0 to 6dB @ 40 Hz. High-level input with auto-detection & auto turn-on; RCA low-level input. Monocanal 1500W. Power RMS- 14.4V 1-Ohm - THD N < 1% 100Hz: 1500W. Power RMS- 14.4V 4-Ohm - THD N < 1% 100Hz: 590W. Power RMS- 14.4V 2-Ohm - THD N < 1% 100Hz: 1000W. Class D Amplifier. Bass boost central frequency: 45Hz. 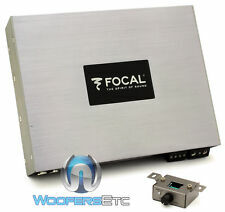 Focal Subwoofer Amplifier. Class-AB amplifier design. Wiring and hardware not included with amplifier. variable bass boost (0-9 dB at 50 Hz). preamp outputs. preamp- and speaker-level inputs. 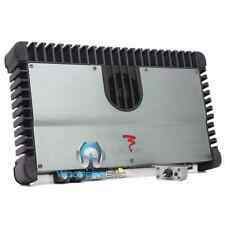 TRAX1.1200D - Precision Power Monoblock 1200W Class D Amplifier. Precision Power Trax Series TRAX1.1200D. Class-D 2 ohm Stable Monoblock Amplifier. (2) RIP-300S - Focal Auditor 12" 800W Peak High Power Subwoofers. • Maximum Power (2 Ohms) 1×700 Wrms. • Maximum Power (1 Ohm) 1×1000 Wrms. • Bandwidth 15Hz–250Hz. CONDITION: NEW. • CEA Power (4 Ohms) 1×420 Wrms. 320 watts RMS x 1 at 4 ohms. 550 watts RMS x 1 at 2 ohms. 800 watts RMS x 1 at 1 ohm. Mono subwoofer amplifier. Class-D amplifier design. Variable bass boost (0-9 dB at 45 Hz). Optional High Cap outboard capacitor module increases power efficiency. SOLID1 - Focal Monoblock 470 W RMS Power Amplifier. Pair of SUB P25 - Focal 10" 200W RMS 400W Max Single 4-Ohm Subwoofer. Focal's new Solid amplifiers are available in your choice of Black or Red paint. The FD 1.350 is a mono block amplifier specifically designed for handling a subwoofer channel. It has a power of 210 and 350 Watts RMS under 4 and 2 Ohms respectively. • Mono Class D amplifier with dual output High-level inputs with auto-detection / RCA low-level inputs. 155 watts RMS x 2 at 4 ohms (265 watts RMS x 2 at 2 ohms). 530 watts RMS x 1 bridged output at 4 ohms (750 watts RMS x 1 at 2 ohms). 1-ohm stable in stereo mode (430 watts RMS x 2 at 1 ohm). 2-channel car amplifier. 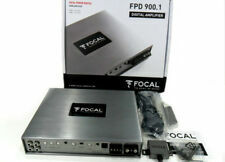 1 set x Focal FPD 900.1 Amplifier. 500 watts RMS x 1 at 4 ohms (850 watts RMS x 1 at 2 ohms). Mono subwoofer amplifier. 1-ohm stable — 500 watts RMS x 1 at 1 ohm. adjustable bass boost level: 0 to 6dB @ 40 Hz. Mono Amplifier. 2 x 10 x 7-3/4 in (50 x 254 x 196mm). Adjustable gain 200mV to 19V. Frequency response 5Hz–25kHz. Bass Boost 0to 6dB@40Hz. Signal/noise ratio >95dB (A). Power into 2Ohms 1x900W rms. Power into 4 Ohms 1x550W rms. Brand new never used. Upgrading to a bigger amp. 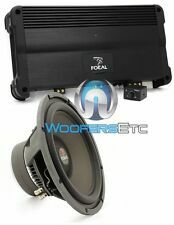 FOCAL FPD 900.1 CAR MONOBLOCK 900W RMS SUBWOOFERS SPEAKERS BASS AMPLIFIER NEW. Condition is New. Shipped with USPS Priority Mail. 320 watts RMS x 1 at 4 ohms. 550 watts RMS x 1 at 2 ohms. 800 watts RMS x 1 at 1 ohm. Mono subwoofer amplifier. Class-D amplifier design. Variable bass boost (0-9 dB at 45 Hz). Dynamic soft clipping protects speakers from distortion. SOLID1 - Focal Monoblock 470 W RMS Power Amplifier. Pair of SUB P30 - Focal 12" 250W RMS 500W Max Single 4-Ohm Subwoofer Each Sub. Focal's new Solid amplifiers are available in your choice of Black or Red paint. Focal's new Solid amplifiers are available in your choice of Black or Red paint. (2) SOLID-1 - Focal Monoblock 1000W RMS Power Amplifier. Power RMS (4 Ohms)1x300W. Line input impedance 20 kOhms. Input sensitivity 0.2 - 5v. 33V2 - Focal 13" 800W DVC Polyglass Series Subwoofer. 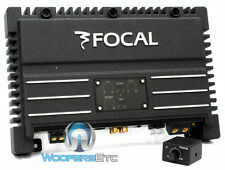 FPP-1000 - Focal Monoblock 500W RMS Class A/B Power Performance Series Amplifier. Monoblock Power Performance Series Class A/B Car Amplifier. Woofer Composition: Polyglass. Following the CEA-2006 criteria, the FPP 1000 is rated at 300 Watts RMS x 1 channel with an 85dBA signal to noise ratio. 2-Ohm Stable: The FPP 1000 is stable down to 2-ohms. The amplifier is rated at 500 Watts RMS x 1 channel in 2 ohms. Focal makes sure that nothing stands in the way of your music, especially your amplifier. Each Focal Solid amp features low-noise inputs that let you connect to almost any receiver — even your factory stereo.